This article is about the historical British railway company. For the heritage railway on one of its former routes, see Midland Railway – Butterley. For other uses, see Midland Railway (disambiguation). Midland Railway coat of arms at Derby Station. The wyvern that surmounts it had been used by the Leicester and Swannington Railway. It was the emblem of the rulers of Mercia and was used extensively as an emblem by the Midland. The Midland Railway (MR) was a railway company in the United Kingdom from 1844 to 1922, when it became part of the London, Midland and Scottish Railway. It had a large network of lines managed from its headquarters in Derby. It became the third-largest railway undertaking in the British Isles (after the Great Western Railway and the London and North Western Railway). The Midland Railway originated from 1832 in Leicestershire / Nottinghamshire, with the purpose of serving the needs of local coal owners. The company was formed on 10 May 1844 by the merger of the Midland Counties Railway, the North Midland Railway, and the Birmingham and Derby Junction Railway, the Birmingham and Gloucester Railway joined two years later. These met at the Tri-Junct station at Derby, where the MR established its locomotive and later its carriage and wagon works. Leading it were George Hudson from the North Midland, dynamic but unscrupulous, and John Ellis from the Midland Counties, a careful businessman of impeccable integrity. James Allport from the Birmingham and Derby Junction Railway found a place elsewhere in Hudson's empire with the York, Newcastle and Berwick Railway, though he later returned. The MR was in a commanding position having its Derby headquarters at the junctions of the two main routes from London to Scotland, by its connections to the London and Birmingham Railway in the south, and from York via the York and North Midland Railway in the north. Almost immediately it took over the Sheffield and Rotherham Railway and the Erewash Valley Line in 1845, the latter giving access to the Nottinghamshire and Derbyshire coalfields. It absorbed the Mansfield and Pinxton Railway in 1847, building the Erewash Valley Line from the latter between Chesterfield and Trent Junction at Long Eaton, completed to Chesterfield in 1862, giving access to the coalfields that became its major source of income. Passengers from Sheffield continued to use Rotherham Masborough until a direct route was completed in 1870. Meanwhile, it extended its influence in the Leicestershire coalfields, by buying the Leicester and Swannington Railway in 1846,[page needed] and extending it to Burton in 1849. After the merger, London trains were carried on the shorter Midland Counties route. The former Birmingham and Derby Junction Railway was left with the traffic to Birmingham and Bristol, an important seaport. The original 1839 line from Derby had run to Hampton-in-Arden: the Birmingham and Derby Junction Railway had built a terminus at Lawley Street in 1842, and on 1 May 1851 the MR started to run into Curzon Street. The line south was the Birmingham and Bristol Railway, which reached Curzon Street via Camp Hill. These two lines had been formed by the merger of the standard gauge Birmingham and Gloucester Railway and the broad gauge Bristol and Gloucester Railway. Since it would have brought broad gauge into Curzon Street with the possibility of extending it to the Mersey, it was something that the other standard gauge lines wished to avoid, and they pledged to assist the MR with any losses it might incur. [page needed] In the event all that was necessary was for the later LNWR to share Birmingham New Street with the Midland when it was opened in 1854, and Lawley Street became a goods depot. The MR controlled all the traffic to the North East and Scotland from London. The LNWR was progressing slowly through the Lake District, and there was pressure for a direct line from London to York. Permission had been gained for the Northern and Eastern Railway to run through Peterborough and Lincoln but it had barely reached Cambridge. Two obvious extensions of the Midland Counties line were from Nottingham to Lincoln and from Leicester to Peterborough. They had not been proceeded with, but Hudson saw that they would make ideal "stoppers": if the cities concerned were provided with a rail service, it would make it more difficult to justify another line. They were approved while the bill for the direct line was still before Parliament, forming the present day Lincoln Branch and the Syston to Peterborough Line. The Leeds and Bradford Railway had been approved in 1844. By 1850 it was losing money but a number of railways offered to buy it. Hudson made an offer more or less on his own account and the line gave the MR an exit to the north, which became the start of the Settle and Carlisle line, and it gave the MR a much more convenient station at Leeds Wellington. In spite of the objections of Hudson, for the MR and others, the "London and York Railway" (later the Great Northern Railway) led by Edmund Denison persisted, and the bill passed through Parliament in 1846. In 1852 an ANB&EJR train arrived in Nottingham with a GN locomotive at its head. When it uncoupled and went to run round the train, it found its way blocked by a MR engine while another blocked its retreat. The engine was shepherded to a nearby shed and the tracks were lifted. This episode became known as the "Battle of Nottingham" and, with the action moved to the courtroom, it was seven months before the locomotive was released. The London and Birmingham Railway and its successor the London and North Western Railway had been under pressure from two directions. Firstly the Great Western Railway had been foiled in its attempt to enter Birmingham by the Midland, but it still had designs on Manchester. At the same time the LNWR was under threat from the GN's attempts to enter Manchester by the Manchester, Sheffield and Lincolnshire Railway. In 1850 the MR, though much more secure, was still a provincial line. Ellis realised that if it were to fend off its competitors it must expand outwards. The first step, in 1853, was to appoint James Allport as General Manager and the next was to shake off the dependence on the LNWR to London. Although a bill for a line from Hitchin into King's Cross jointly with the GN, was passed in 1847 it had not been proceeded with. The bill was resubmitted in 1853 with the support of the people of Bedford, whose branch to the LNWR was slow and unreliable, and with the knowledge of the Northamptonshire iron deposits. The Leicester and Hitchin Railway ran from Wigston to Market Harborough, through Desborough, Kettering, Wellingborough and Bedford, then on the Bedford to Hitchin Line, joining the GN at Hitchin for King's Cross. The line began its life in a proposition presented for the shareholders by George Hudson on 2 May 1842 as: "To vest £600,000 in the South Midland Railway Company in their line from Wigston to Hitchin." a full decade before realisation. The delay was partly due to the withdrawal of GN's interest in the competing scheme, the Bedford and Leicester Railway, after Midland purchased the Leicester and Swannington Railway and the Ashby Canal and Tramway, which were to have been the feeder lines. With the competition thwarted there was less rush to have this line as well as its branch lines to Huntingdon (from Kettering) and Northampton (from Bedford) finished. Both these branches were subsequently built by independent companies. While this took some of the pressure off the route through Rugby, the GNR insisted that passengers for London alight at Hitchin, buying tickets in the short time available, to catch a GNR train to finish their journey. James Allport arranged a seven-year deal with the GN to run into King's Cross for a guaranteed £20,000 a year (equivalent to £1,870,000 in 2018),. Through services to London were introduced in February 1858. The construction of the Leicester and Hitchen railway cost £1,750,000 (equivalent to £172,990,000 in 2018). By 1860 the MR was in a much better position and was able to approach new ventures aggressively. Its carriage of coal and iron – and beer from Burton-on-Trent – had increased by three times and passenger numbers were rising, as they were on the GN. Since GN trains took precedence on its own lines, MR passengers were becoming more and more delayed. Finally in 1862 the decision was taken for the MR to have its own terminus in the Capital, as befitted a national railway. "An Act for the Construction by the Midland Railway Company of a new Line of Railway between London and Bedford, with Branches therefrom; and for other Purpose". The new line deviated at Bedford, through a gap in the Chiltern Hills at Luton, reaching London by curving around Hampstead Heath to a point between King's Cross and Euston. The line from Bedford to Moorgate opened for passenger services on 13 July 1868 with services into St Pancras station starting on 1 October 1868. 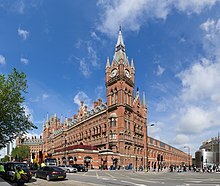 St Pancras station is a marvel of Gothic Revival architecture, in the form of the Midland Grand Hotel by Gilbert Scott, which faces Euston Road, and the wrought-iron train shed designed by William Barlow. Its construction was not simple, since it had to approach through the ancient St Pancras Old Church graveyard. Below was the Fleet Sewer, while a branch from the main line ran underground with a steep gradient beneath the station to join the Metropolitan Railway, which ran parallel to what is now Euston Road. The construction of the London Extension railway cost £9,000,000 (equivalent to £795,400,000 in 2018). The Grade II* listed Manchester Central train shed, a northern terminus of the Midland Railway. From the 1820s proposals for lines from London and the East Midlands had been proposed, and they had considered using the Cromford and High Peak Railway to reach Manchester (See Derby station). Finally the MR joined with the Manchester and Birmingham Railway (M&BR), which was also looking for a route to London from Manchester, in a proposal for a line from Ambergate. The Manchester, Buxton, Matlock and Midlands Junction Railway, it received the Royal Assent in 1846, in spite of opposition from the Sheffield, Ashton-Under-Lyne and Manchester Railway. It was completed as far as Rowsley a few miles north of Matlock in 1849. However the M&BR had become part of the LNWR in 1846, thus instead of being a partner it had an interest in thwarting the Midland. In 1863 the MR reached Buxton, just as the LNWR arrived from the other direction by the Stockport, Disley and Whaley Bridge Railway. In 1867 the MR began an alternative line through Wirksworth (now the Ecclesbourne Valley Railway), to avoid the problem of the Ambergate line. The section from Wirksworth to Rowsley, which would have involved some tricky engineering, was not completed because the MR gained control of the original line in 1871, but access to Manchester was still blocked at Buxton. At length an agreement was made with the Manchester, Sheffield and Lincolnshire Railway (MS&LR) to share lines from a branch at Millers Dale and running almost alongside the LNWR, in what became known as the Sheffield and Midland Railway Companies' Committee. Continuing friction with the LNWR caused the MR to join the MS&LR and the GN in the Cheshire Lines Committee, which also gave scope for wider expansion into Lancashire and Cheshire, and finally a new station at Manchester Central. In the meantime Sheffield had at last gained a main-line station. Following representations by the council in 1867 the MR promised to build a through line within two years. To the MR's surprise, the Sheffield councillors then backed an improbable speculation called the Sheffield, Chesterfield, Bakewell, Ashbourne, Stafford and Uttoxeter Railway. This was unsurprisingly rejected by Parliament and the Midland built its "New Road" into a station at Pond Street. Among the last of the major lines built by the MR was a connection between Sheffield and Manchester, by a branch at Dore to Chinley, opened in 1894 through the Totley and Cowburn Tunnels, now the Hope Valley Line. In the 1870s a dispute with the London and North Western Railway (LNWR) over access rights to the LNWR line to Scotland caused the MR to construct the Settle and Carlisle line, the highest main line in England, to secure access to Scotland. The dispute with the LNWR was settled before the Settle and Carlisle was built, but Parliament refused to allow the MR to withdraw from the project. The MR was also under pressure from Scottish railway companies, which were eagerly awaiting the Midland traffic reaching Carlisle as it would allow them to challenge the Caledonian Railway's dominance on the West Coast traffic to Glasgow and Edinburgh. The Glasgow and South Western Railway had its own route from Carlisle to Glasgow via Dumfries and Kilmarnock, whilst the North British Railway had built the Waverley Line through the Scottish Borders from Carlisle to Edinburgh. The MR was obliged to go ahead and the Settle to Carlisle opened in 1876. The Nottingham and Melton Line of the Midland Railway opened for goods traffic on 1 December 1879 and for passenger traffic on 1 March 1880. By the middle of the decade investment had been paid for; passenger travel was increasing, with new comfortable trains; and the mainstay of the line – goods, particularly minerals – was increasing dramatically. Allport retired in 1880, to be succeeded by John Noble and then by George Turner. By the new century the quantity of goods, particularly coal, was clogging the network. The passenger service was acquiring a reputation for lateness. Lord Farrar reorganised the expresses, but by 1905 the whole system was so overloaded that no one was able to predict when many of the trains would reach their destinations. At this point Sir Guy Granet took over as General Manager. He introduced a centralised traffic control system, and the locomotive power classifications that became the model for those used by British Railways. The MR acquired other lines, including the Belfast and Northern Counties Railway in 1903 and the London, Tilbury and Southend Railway in 1912. It had running rights on some lines, and it developed lines in partnership with other railways, being involved in more 'Joint' lines than any other. In partnership with the GN it owned the Midland and Great Northern Joint Railway to provide connections from the Midlands to East Anglia, the UK's biggest joint railway. The MR provided motive power for the Somerset & Dorset Joint Railway, and was a one-third partner in the Cheshire Lines Committee. In 1913 the company achieved a total revenue of £15,129,136 (equivalent to £1,462,280,000 in 2018) with working expenses of £9,416,981 (equivalent to £910,180,000 in 2018). In June 1850, the boiler of a locomotive exploded at Kegworth railway station, Nottinghamshire. In 1850, a train was in a rear-end collision with an excursion train at Woodlesford station, Yorkshire. The cause was a signal not being lit at night. In 1853, the boiler of a locomotive exploded whilst it was hauling a freight train near Bristol, Gloucestershire. On 28 August 1875, a passenger train overran signals and was in a rear-end collision with an excursion train at Kildwick, Yorkshire. Seven people were killed and 39 were injured. On 11 August 1880, a passenger train was derailed at Wennington, Lancashire. Eight people were killed and 23 were injured. On 19 August 1880, a passenger train stops inside Blea Moor Tunnel, Yorkshire due to a faulty brake pipe. An express passenger train overruns signals and is in a rear-end collision at low speed. On 27 August 1887, an express passenger train overran signals and collided with a freight train that was being shunted at Wath station, Yorkshire. Twenty-two people were injured. On 9 June 1892, a passenger train overran signals and was in collision with another at Esholt Junction, Yorkshire. Five people were killed and 30 were injured. On 3 December 1892, a freight train crashed at Wymondham Junction., Leicestershire, severely damaging the signal box. On 2 September 1898, an express passenger train was derailed at Wellingborough, Northamptonshire by a trolley that had fallen off the platform onto the track. Seven people were killed and 65 were injured. On 24 July 1900, a passenger train was derailed at Amberswood, Lancashire. One person was killed. On 1 December 1900, a freight train was derailed at Peckwash near Duffield, Derbyshire. On 23 December 1904, an express passenger train was derailed at Aylesbury, Buckinghamshire due to excessive speed on a curve. Another express passenger train collided with the wreckage at low speed. Four people were killed. On 19 January 1905, an express passenger train overran signals and was in collision with a passenger train at Cudworth, Yorkshire. Seven people were killed. In June 1907, a luggage train was derailed by trap points at Silkstream Junction after the driver misread signals. On 24 December 1910, an express passenger train was in a rear-end collision with two light engines near Moorcock Tunnel, to the south of Ais Gill summit, due to errors by the signalman at Hawes Junction and the firemen of the light engines. The train was derailed and caught fire. Twelve people were killed and seventeen were injured. On 2 September 1913, a passenger train overran a signal and was in a rear-end collision with another passenger train between Mallerstang and Ais Gill, i.e. to the north of Ais Gill summit. Sixteen people were killed and 38 were injured. The MR operated ships from Heysham to Douglas and Belfast. In 1914 all the railways were taken under the control of the Railway Executive Committee. The MR had not recovered from this when the Government passed the Railways Act 1921, by which it was compulsorily merged with the LNWR, the Lancashire and Yorkshire, the Caledonian, the Glasgow and South Western Railway and minor lines such as the Furness and the North Staffordshire to form the London Midland and Scottish Railway on 1 January 1923. ^ a b c Barnes, E.G. (1969). The Rise of the Midland Railway 1844–1874. New York: Augustus M. Kelley. p. 308. ^ a b Whitehouse, Patrick; Thomas, David St John (2002). LMS 150 : The London Midland & Scottish Railway A century and a half of progress. Newton Abbot: David & Charles. ISBN 0-7153-1378-9. ^ Edward Walford (1878). "28. Agar Town, and the Midland Railway". Old and New London: Volume 5. Cassell, Petter and Galpin. pp. 368–373 – via British History Online. ^ Christiansen, Rex (1983). A Regional History of the Railways of Great Britain, Volume 7 The West Midlands. David St John Thomas David & Charles. p. 53. ISBN 0-946537-00-3. ^ a b c Chisholm, Hugh, ed. (1911). "Allport, Sir James Joseph" . Encyclopædia Britannica (11th ed.). Cambridge University Press. ^ Twells, H.N. (1985). A Pictorial Record of the Leicester and Burton Branch Railway. Burton-upon-Trent: Trent Valley Publications. ISBN 0-948131-04-7. ^ a b Vaughan, A. (1997). Railwaymen, Politics and Money. London: John Murray. ^ Pinton, B (2005). Birmingham-Derby: Portrait of a Famous Route. Runpast Publishing. ^ "Great Northern Railway Company: Records". The National Archives. 1845. Retrieved 26 December 2010. ^ Anderson, P.H. (1985). Forgotten Railways Vol 2: The East Midlands (2nd ed.). Newton Abbot: David and Charles. ^ Hadfield, Charles (1970). The Canals of the East Midlands. David and Charles. ISBN 0-7153-4871-X. ^ a b c d e UK Retail Price Index inflation figures are based on data from Clark, Gregory (2017). "The Annual RPI and Average Earnings for Britain, 1209 to Present (New Series)". MeasuringWorth. Retrieved 27 January 2019. ^ Davies, R.; Grant, M.D. (1984). Forgotten Railways: Chilterns and Cotswolds. Newton Abbot, Devon: David St John Thomas. pp. 110–111. ISBN 0-946537-07-0. ^ "Local and Personal Acts". The Sessional Papers Printed by Order of The House of the Lords Or Presented by Royal Command in the Session 1863. 1863. p. 119 – via Google Books. ^ Casserley, H.C. (April 1968). "Cheshire Lines Committee". Britain's Joint Lines. Shepperton: Ian Allan. pp. 68–80. ISBN 0-7110-0024-7. ^ a b Wolmar, Christian (2008). Fire and Steam. Atlantic Books. ISBN 978-1-84354-630-6. ^ Binns, Donald (1995). The Skipton-Colne Railway and The Barnoldswick Branch. Trackside Publications, Skipton, N. Yorkshire. ISBN 1900095009. ^ Markham, C.A. (1970) . The Iron Roads of Northamptonshire. Wilbarston: Pilgrim Publications. ^ Maggs, C (1986). The Birmingham Gloucester Line. Cheltenham: Line One Press. ISBN 0-907036-10-4. ^ Maggs, Colin G. (1992) . The Bristol and Gloucester Railway and the Avon and Gloucestershire Railway (Oakwood Library of Railway History) (2nd ed.). Headington: Oakwood Press. ISBN 0-85361-435-0. OL26. ^ Hadfield, Charles (1970). The Canals of the East Midlands (2nd ed.). David & Charles. ISBN 0-7153-4871-X. ^ Vanags, J (2001). The Mansfield and Pinxton railway. Mansfield: Old Mansfield Society. ISBN 0-9517948-5-X. ^ Oakley, Mike (2003). Gloucestershire Railway Stations. Wimborne: Dovecote Press. ISBN 1-904349-24-2. ^ a b Christiansen, Rex (1983). A Regional History of the Railways of Great Britain Volume 7. ISBN 0-946537-00-3. ^ a b Hewison, Christian H. (1983). Locomotive Boiler Explosions. Newton Abbot: David & Charles. pp. 35–36. ISBN 0 7153 8305 1. ^ a b c d e Hall, Stanley (1990). The Railway Detectives. London: Ian Allan. pp. 26, 50–52, 66. ISBN 0 7110 1929 0. ^ a b Earnshaw, Alan (1991). Trains in Trouble: Vol. 7. Penryn: Atlantic Books. pp. 4–5, 9. ISBN 0-906899-50-8. ^ Earnshaw, Alan (1990). Trains in Trouble: Vol. 6. Penryn: Atlantic Books. p. 6. ISBN 0-906899-37-0. ^ Spence, Jeoffry (1975). Victorian & Edwardian Railways from old photographs. London: Batsford. p. 76. ISBN 0 7134 3044 3. ^ Trevena, Arthur (1981). Trains in Trouble: Vol. 2. Redruth: Atlantic Books. pp. 19–20. ISBN 0-906899-03-6. ^ Earnshaw, Alan (1993). Trains in Trouble: Vol. 8. Penryn: Atlantic Books. p. 4. ISBN 0-906899-52-4. ^ Doyle, Peter (2012). First World War Britain. Shire Publications Ltd. p. 58. ISBN 978-0-74781-098-8. ^ Bilson, P (1996). Derby and the Midland Railway. Breedon Books, Derby. ISBN 1-85983-021-8. Truman, P.; Hunt, D. (1989). Midland Railway Portrait. Sheffield: Platform 5. ISBN 0-906579-72-4. Williams, Frederick Smeeton (1876). The Midland railway: its rise and progress. Strahan & Co.
Official Guide to the Midland Railway. London: Cassell & Company. 1894. Barnes, E.G. (1966). The rise of the Midland Railway, 1844–1874. London: George Allen and Unwin. Barnes, E.G. (1969). The Midland main line, 1875–1922. London: George Allen and Unwin. ISBN 0-04-385049-9. Talbot, Frederick A. (1913). "The Waverley way to the north". Railway Wonders of the World. pp. 541–552. Wikimedia Commons has media related to Midland Railway. This page was last edited on 17 February 2019, at 05:20 (UTC).